Our person first approach means we believe nothing should slow you down. 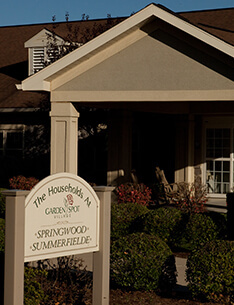 Our skilled nursing households provide the support you need with the freedom and flexibility to live life to the fullest. Family members are welcome any time and there is always a place at the table. Of course there are those who need care 24/7 that can no longer do all the things they used to do. Our professional care teams are second to none so you know your loved ones are getting the best care possible. Since embarking upon the person-centered model of care in 2006, the Households at Garden Spot Village have experienced international attention. Thousands of professionals and policy-makers from across the United States have visited either for tours or intensive workshops in order to experience the household difference. Delegations have been hosted from Canada, Mexico, Ireland, the U.K. and China. It's a unique living experience that provides a sense of purpose and opportunity for people that require skilled nursing. Happiness comes from within. At Garden Spot Village, it springs from our interdisciplinary team of experienced nurses, social workers, certified activity directors, dietitians and therapists. And always you.